An accident with a rotary mower can cost you your life! We all know that a small push mower is a dangerous piece of equipment. Large agricultural mowers , by their nature can do much more damage to an individual. Following safety practices, using proper protective equipment correctly and keeping the mower in good repair will all help keep the operator safe. The main source of danger with any mower is the blade, which does the actual work of cutting. In order to perform its task efficiently, the blade must be sharp and travel at a high speed. This sharp, high-speed blade can cause serious injury if a hand or foot is allowed to get under the mower deck while the engine is running. The manner in which the mower is operated on slopes is also important. Push mowers should always be operated across the slope so your feet will not get under the mower if you slip, nor will the mower roll down the slope and run over you. Pulling a push type mower is also dangerous, as your foot might slip under the mower. Riding mowers are generally more stable when operated up and down the slope. There is also the danger of objects being thrown from under the mower by the blade, whose tip may be moving as fast as 200 miles per hour. A person struck by a rock or piece of wire thrown with such force could experience severe injury or even death. Fueling hot engines and smoking while refueling can result in serious burns, often to large portions of the body. Another source of danger is that of carbon monoxide poisoning. Whenever an engine is started in an enclosed area, such as a garage, the danger of carbon monoxide poisoning exists. Prepare lawn/field for mowing. Every time before you mow, check your surface for items such as sticks, rocks, toys, sports equipment, dog bones, wire, and equipment parts. Make sure miscellaneous items are not hidden in tall grass. Also look for and mark immovable objects, such as pipes, or partially buried rocks. Running into a fixed object can shatter the blade and throw jagged chunks of metal out the discharge chute or under the housing. Obstacles such as ditches, rocks, and stumps can throw you off the tractor or cause a tractor upset. Be especially alert when objects may be hidden by tall grass, weeds or brush. Handle fuel with care. A hot muffler can ignite vapors from the gasoline Always allow the mower to cool down before refueling. Any gasoline, which is spilled, should be wiped up immediately. Always refuel outdoors and move away from the fueling location at least 25 feet before starting the engine to avoid igniting fuel vapors which may linger for some time. Do not smoke while refueling. Wear appropriate clothes. Always wear sturdy, non-slip shoes instead of tennis shoes or sandals. Steel-toe safety footwear offers the most protection against the blade. Hearing protection, gloves and safety glasses are also needed. Use the right type of mower for the job. Know the job you are going to do, and use the correct kind of mower for it. For example, don't try to cut brush with a mower designed only for forage. You could be exposed to hazards caused by machine failure. Use heavy-duty blades where they are needed, and use a large enough machine to do the job properly. Check your operator's manual for the type of job your mower is designed to do. 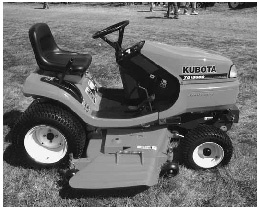 Rear-engine riding mowers, lawn tractors and garden tractors are all designed to cut grass; however, the engine power, cutting widths, and other capabilities of these products are very different. Keep others away. Don't allow extra riders on your tractor, and keep other people out of your working area. Serious injury or death can result from falling off the tractor and being run over by the mower, the tractor wheel or being hit by a thrown object. 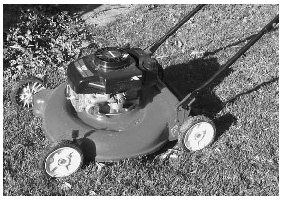 Watch for objects like tin cans, stones, wire or other items that could be hurled by the mower blades. These can cause serious injury. Never attempt to unclog or work on a lawnmower while the engine is running. Any time it is necessary to reach under the mower, disconnect the sparkplug wire to insure that the engine cannot start for any reason. It does take a little extra time to restart the engine every time, but not as long as it does to recover from a serious injury. Keep the blade sharp to reduce the power required and to provide smoother cutting, and run the engine at the lowest speed that will do the job. The lower blade speed will reduce the force with which objects are thrown by the mower while at the same time reducing engine wear. Mow only in daylight. Do not operate the mower in wet grass (walking on wet grass is a slipping hazard for you and more likely to cause the mower to clog). Before mowing adjust the cutting height on mowers. Before operating your mower, familiarize yourself with its maintenance procedures. Study your operator's manual carefully. Learn the location and use of controls, gauges, and dials for the tractor. Familiarize yourself with speeds, slope capabilities, braking and steering characteristics, and tractor-mower clearances. Be sure the tractor is equipped with a rollover protective structure (ROPS) and a seat belt. If not, have it retrofitted for one. In Ontario, tractors over 20 horsepower require a ROPS. Check the discharge chute to see that it is present and pointed downward. If you will be driving on public roads be sure the slow moving vehicle (SMV) emblem is in place. Check that the warning lights are present and operating. Check overhead clearance of electrical wires and other obstructions, especially if you are using a wing-type, boom-type, or flail mower. If your tractor is equipped with rollover protection, use the seat belt. Be sure blades are stopped. Many rotary mowers have blades that continue to rotate for some time after the PTO is disengaged. Be sure they have stopped turning before approaching the mower. Be careful when turning sharp corners. On pull-type mowers, the rear tractor wheels could catch the mower frame and throw it toward you. With three- point-hitch mounted mowers, the mower swings outward when you make a turn. Front wheel weights may be needed to help you keep control. Rotary mowers are often equipped with runners and safety chain guards. 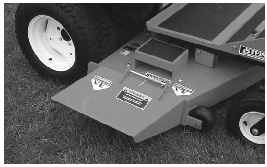 To avoid excessive wear on the runners, keep the mower just high enough so that it doesn't ride on the runner shoes. The chain guards reduce the possibility of objects being thrown from under the mower. Be sure chain guards are maintained and kept in place. If you must remove them or raise them for certain crops, be sure to replace or readjust them as soon as you are finished. Power transmission shafts should be protected by shields or guards. Keep them in place on the machine. Always replace shields and guards after maintenance or repair jobs are completed. Be sure your hands and shoes are clean and dry before mounting the tractor to prevent slipping. Use the steps and hand bars. Keep wheels wide apart for stability. Disengage the PTO before cranking the engine. Raise the mower high and use low rpm before engaging power to the unit. Use a ground speed based on length and density of material being cut - normally between 2-5 mph. Mow up and down slopes with rear-mount, pull-type, and wing-type mowers. Mow across slopes with side-mount, offset, and sicklebar mowers. Look behind you before backing-up. When finished or stopping, disengage the PTO, place shift in neutral or park, set parking brake, turn engine off, and wait for all movement to stop before dismounting. Remove the key if leaving the tractor for any length of time. Always block the mower if working under it for any reason. Before mowing: Make certain all safety devices are in place and operating. Be sure the mower is equipped with a working engine interlock and a "deadman" control. Wear heavy leather gloves to remove and/or replace the blades. Never wear gloves while sharpening the blade on a power grinder as the gloves could be caught and pulled into the grinding wheel. Be sure the mower and transmission are disengaged before starting the engine. Drive the mower up and down gentle slopes for best stability. Back up moderate slopes. Avoid steep slopes completely. Slow down when turning sharply and on slopes to avoid tipping. Always look behind you for small children, pets, or obstructions, before backing the mower. Turn off the engine and wait for moving parts to stop before dismounting. Remove the key! Before mowing. Be sure that all safety devices are in position and working - rear shield, grass chute deflector, handle up-stops (not on electric models), and "dead man control." Adjust cutting height and blade condition- sharpen if necessary (engine must be shut off). If your electric mower isn't labeled "double insulated" never plug into anything but a grounded 3-prong outlet. Use a ground fault interrupter (GFI) for maximum safety. Do not push a running mower over gravel, stones, or hard objects such as pipes, rocks, or sidewalks. Push the mower forward - do not pull it. Mow across the slope so if you slip you are less likely to get your feet in the blade. Keep electric cord out of the mowing path. Keep hands and feet clear of the blade housing and the discharge chute. Do not run with push powered mowers. If using a push powered mower be careful to not overdo your work capacity especially on hot days. Take frequent rest breaks especially if the operator is out of condition. Point the discharge chute away from people, pets, buildings, windows, and glass doors. Turn the mower off if you leave it for even a moment. Make sure that shields and other guards, such as the rear drag shield and the discharge deflector, are in place and working properly. Use the recommended grounded extension cord, if using an electric lawn mower, and follow the applicable electrical safety procedures described in operator's manual. Always push the mower in a forward direction. Cut the throttle to idle and make sure the mower will not roll when stopping to pick up debris. 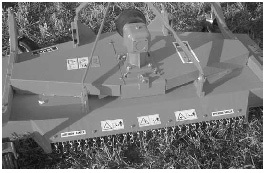 Set mower at the highest cutting level when operating on rough ground. Use caution around low hanging branches and shrubs. Operate a "push" mower standing up straight, not bent over. Mow across slopes. Your feet are less likely to slide under the mower and the mower cannot roll back. Expose the underside of a mower for maintenance by tipping it by the handle but only, after shutting it off, ensuring the blade has stopped rotating, and disconnecting the spark plug wire (or disconnecting an electric lawn mower). Stop the lawn mower immediately if the blade hits any hard object, inspect the blade, and make the necessary repairs before using the mower again. Use a stick to unclog or remove grass from the mower (after you have turned off the mower). Mow away from the power cord if using an electric powered lawn mower. Disconnect electric lawn mowers or turn off gas-powered mowers immediately after use. Do not pull the mower toward you (or your feet). Do not reach under machine. Disconnect the spark plug wire before sharpening, replacing and cleaning the blade or any part of the mower. Do not fuel the mower when engine is hot or while the engine is running. Do not lift or tilt the mower while it is running. Do not leave blades rotating when crossing a graveled area. Do not remove the grass catcher or unclog the chute while the motor is running. Mow straight up and down slopes rather than sideways for greater stability (unless mower is counterbalanced). Use approved hitch points, limit load weights and size to what is recommended by the manufacturer. Do not turn sharply. use counterweights as recommended by manufacturer. Disengage power to attachments and stop the motor before leaving operator's position or making any repairs or adjustments by: setting the brakes; putting the transmission in park, if possible; turning off the ignition and removing the ignition key. Do not remove grass catcher or unclog chute with the motor running. Do not leave mower on a slope.